GMWA 2011 To Be Held in Tampa, Florida!Take a Peak @ Some of the Highlights! 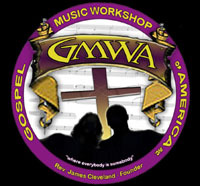 This year’s Gospel Music Workshop of America (GMWA) will take place in Tampa, Florida at the Tampa Convention Center from August 13th-19th. The week will be filled with events. There will be showcases, concerts, daily services, and a special concert commemorating the late Reverand James Cleveland, founder of GMWA. Verizon “How Sweet The Sound” will sponsor two midnight musicals that will feature: Kirk Franklin, James Fortune & F.I.Y.A, Rance Allen, John P.Kee, Dorinda Clark-Cole, Marvin Sapp, Jessica Reedy, and JJ Hairston & Youthful Praise. GMWA events will also include the Crystal Mic Media Awards Ceremony, which recognizes achievement in gospel music radio and media. For more information regarding events go to the GMWA National Website.